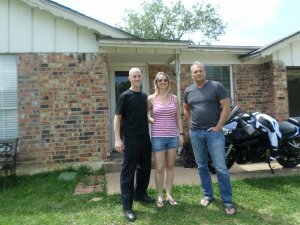 No matter what the real estate market is like in Texas, it’s always a smart thing to look at all of your options for selling your property. What is the best way to sell your property? Are there any differences to selling one way over another? Check out the details below and compare all of your options. Find Out What Is Best For Your Individual Situation. As you check out these numbers, you’ll start to see the benefits of selling your house each way. Then you’ll figure out which way will help you the most. Which way meets the needs of your specific circumstances? What are the major positives of selling your house through an agent and directly to a house buying company? Of course, if your house needs thousands in repairs, then we won’t be able to give you the highest dollar offer. But we can give you an offer that is reasonable for the house’s condition. Get a fair offer in 24 -48 hours and close in as soon as 5 days. Yes, you can get a fair offer for your house in 24 – 48 hours. Then we can schedule closing for as soon as 5 days. Is time crucial for you or your situation? If you are moving soon and don’t want to have to pay 2 house payments, then time is very crucial to your offer. Closing really soon is also critical for many people. We have a team of real estate professionals that will help your closing get completed as soon as possible. All those monthly bills really add up. The longer that you keep a property in your name the longer you’ll have to keep paying those monthly bills – mortgage payments, insurance payments, tax payments, and utility payments. It all adds up to a large amount to pay, especially when you are already having a tough time financially. That’s why when we buy a house fast, we are relieving the home seller’s stress. 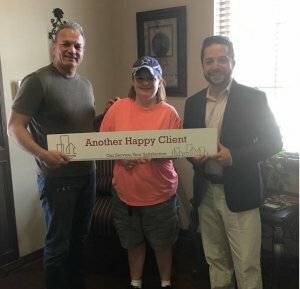 We love helping people move forward with their lives and get a troublesome property behind them. We buy houses in As-Is condition. So you don’t have to fix or repair or paint anything in order to sell it. We don’t have to ask a bank for a loan to by your house. So banks will not hold up you getting your money fast. Forget about the closing costs. Because we pay those also. We want you to have the best closing experience possible. You will not even have to clean up because our crews will take care of everything. We want you to have a hassle-free experience when you sell your home to us. When you get our offer, you’ll have no obligation to accept our offer. No commissions. No hassles. No months of waiting. Just fill out the short form below or give us a call at (817) 886-8295 and let’s chat! Our process is simple and you can close on the date of your choice. You have nothing to lose by getting an offer (no obligations – no pressure). But you could potentially lose thousands of dollars or months of your time by not testing us out and requesting your FREE house offer below. 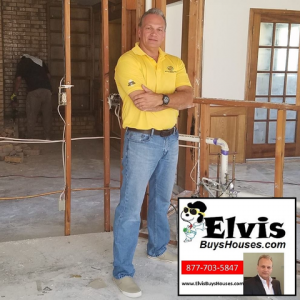 Elvis Buys Houses in ANY CONDITION and provides an ALL CASH payment! No Commissions, Agents, or Fees. You'll Receive an all Cash Offer Same Day or in 24 hours or less! Here at Elvis Buys Houses we don’t use bank financing so you don’t have to worry about our ability to close on a deal.